Italian niche line Laboratorio Olfattivo has launched Nerosa, a new fragrance. A sublime Saffron opens this fragrance before giving way to a powerful Rose that uses Oud, Amber, Sandalwood and leather notes still maintaining its passionateness and leaving an intriguing trail of perfume behind you. A scent rich of natural raw materials to express its several facets. Additional notes include clove, nutmeg, labdanum, guaiacwood, ylang ylang, geranium, elemi, vetiver, patchouli, cedar, benzoin, castoreum, nagarmotha and birch leaf. 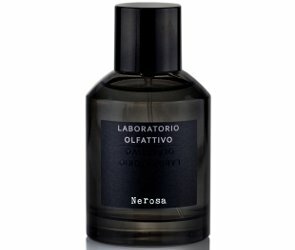 Laboratorio Olfattivo Nerosa is available in 30 or 100 ml Eau de Parfum. Yes … “passion” would have fit just fine, wouldn’t it. Nerotic, Vanhera, now Nerosa – I can see a trend. I do like the list of notes though. My synthetic rose oud senses are tingling….